Monopoly is back at McDonald's (MCD). The world's largest burger chain has revived its annual promotion, and Big Mac lovers have until Oct. 27 to collect game stamps themed to Hasbro's (HAS) Monopoly board game. It's a big deal, and McDonald's can use the extra attention. The fast-food chain has posted negative year-over-year comparable-restaurant sales in nine of the past 10 months. Let's look at some of things that you might not know about the four-week promotion. 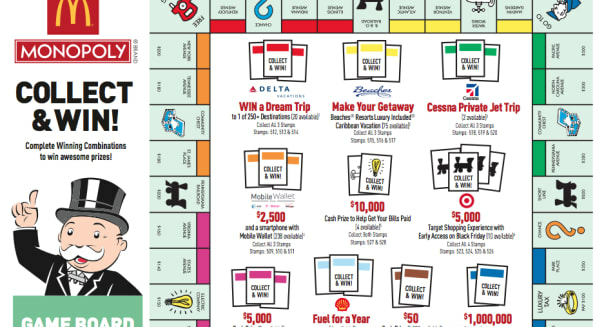 The top prize is once again a $1 million prize if a customer nabs the Park Place and Boardwalk pieces. However, the lucky winner had better not go on a $1 million shopping spree. Tax considerations aside, the winning prize is actually an annuity -- $50,000 every year for the next 20 years. That does add up to $1 million, but you have to factor in inflation. The actual value of the $1 million prize in today's dollars is closer to half that sum. The odds of finding Park Place are 1 in 11, but the odds of finding Boardwalk are 1 in 651 million. So your chances of getting them both to win the $1 million grand prize are about 1 in 3.5 billion. Big prizes draw big attention, but they also bring out the worst in scammers. In 1995, a head of security for the marketing company running the promotion started to steal the top prizes. He would then pass them along to associates in exchange for a piece of the action. By the time it was uncovered a few years later, this multi-state crime ring had claimed $20 million in prizes. Eight people were ultimately arrested. Realizing that it had a public relations nightmare on its hands, McDonald's acted quickly. It announced that it would be dishing out an additional $10 million in prizes in the next installment of the Monopoly promotion. That seems to have done the trick. Consumers flocked back to the Golden Arches during the promotion, and McDonald's has yet to be connected to another internal security breach. In a world of seasonal rollouts -- from pumpkin spice lattes in October to eggnog shakes in December -- McDonald's favors late September to launch this annual promotion, which had its debut in 1987. It ran that way in three of the past four years, but last year, facing weak store-level trends, McDonald's rolled out the game in mid-July to give sales a much-needed lift. This could be a good thing for McDonald's investors. After all, when it does put out same-restaurant sales for October come early November, it will be comparing the Monopoly-backed traffic boost of this month pitted against the Monopoly-less October of 2013. Prizes like the $1 million annuity and a Cessna jet vacation may draw the attention, but your odds of walking away a winner are a spiffy 1 in 4. Most are instant-win prizes, and that usually means free food. It's a smart move. Folks don't get discouraged because repeat customers can feel confident that they will eventually win something, and since they have to come back to redeem those free drinks, sandwichs, or fries, that virtually ensures another visit during which the patron will likely spend money in addition to claiming their prize item. Everyone's a winner, including McDonald's. Motley Fool contributor Rick Munarriz has no position in any stocks mentioned. The Motley Fool recommends Hasbro and McDonald's and owns shares of Hasbro. Try any of our Foolish newsletter services free for 30 days.